Kahului Airport to Kaanapali: When you land in Kahului after a long flight, you may be looking forward to a quick trip to your Kaanapali hotel. Unfortunately, the ride will take you about 50 minutes to travel the 28.8 miles. That’s WITHOUT traffic. During heavy traffic times, you may have to double your ride-time. Wailea to Lahaina: If you’re staying in Wailea and want to do some shopping in Lahaina, pack for quite the commute. The drive is 29 miles, and it will take you about 49 minutes to get there (more with heavy traffic). If you land in Kahului, you may want to spend your first day at the Maui Ocean Center. That's because getting to Kahului from the resort areas can take nearly an hour. Kahului to Hana: The famous Hana Highway isn’t just well-known for its beauty — it’s also known for being an uber-slow road. The road is windy and narrow, and it can be crowded during peak travel season. So, expect the 30.6 mile drive to take you one hour 12 minutes. But, add another two hours for stops along the way to gaze at the beautiful scenery! Lahaina to Wailuku (Iao Valley): Staying in Lahaina, but want to take the kids to the Maui Ocean Center? 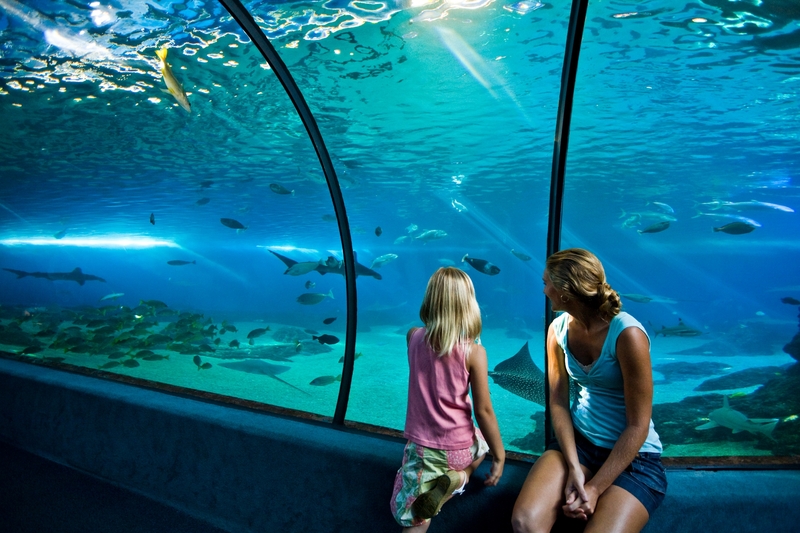 You’ll spend about 38 minutes in the car traveling the 22.4 miles to the aquarium. Lahaina to Haleakala: Haleakala, the “House of the Sun,” is one of the most popular visitor destinations on Maui. But, from Lahaina, it will take you about one hour and 26 minutes to travel the 49.7 miles to get there. Poipu to Waimea Canyon: If you’re staying in the resort area of Poipu, but want to head-out to Waimea Canyon, plan to spend about 48 minutes traveling the 25.5 miles there. 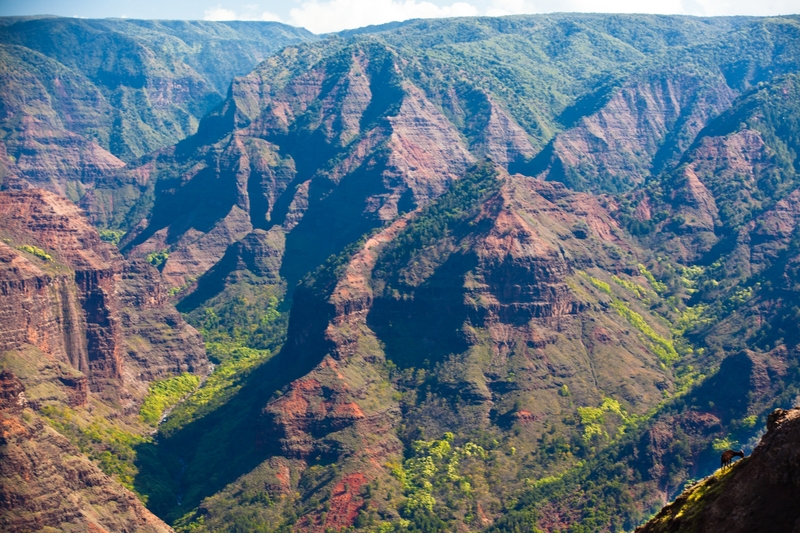 But, it’s well-worth the trip — Waimea Canyon is called “The Grand Canyon of the Pacific” for a reason. Lihue to Kapaa: Interested in seeing the Fern Grotto, but staying in Lihue? You have a relatively short trip — 20 minutes to travel 10.6 miles. Lihue to Na Pali Coast: Who can resist the beautiful Na Pali coast on the North Shore of Kauai, near Princeville? In the summer, the waves are just tolerable enough to take a boat ride and see them up-close. But, be prepared for a bit of a haul. It will take you about 51 minutes to travel the 29.7 miles to the area. Kona to Hawaii Volcanoes National Park: You’ll want to bring some food and water for your trip from Kona to Hawaii Volcanoes National Park. That’s because the trip will take you a whopping two hours and 14 minutes to travel the 102.2 miles. Keep in mind, the road is a bit treacherous, too. So, drive slowly! Waimea Canyon is one of the most popular visitor destinations on Kauai, but it will take you a while to get there from most resort areas, thanks to the windy roads. Waikoloa to Mauna Kea: Expect to spend about an hour and 18 minutes in your car during the 48.2 mile drive to Mauna Kea. However, spending time at one of the observatories atop the summit is one of the most breathtaking experiences you’ll have during your time in Hawaii. Hilo to Hawaii Volcanoes National Park: Should you decide you’d like to fly into Hilo to be closer to Hawaii Volcanoes National Park, you’re in luck. The drive is only 43 minutes and 28.8 miles. Of course, if you want to avoid driving AT ALL, take advantage of Hawaii Aloha Travel’s tours, such as the Big Island Circle Island Tour, the Maui Sightseeing Tour, or the Kauai Movie Tour. Plus, most of the island excursions booked through Hawaii Aloha Travel come with complimentary hotel pick-up! You need to understand travel times on Hawaii’s neighbor islands, so you can get where you need to be. After all, just because you’re on vacation, doesn’t mean you can be late!